All lectures are held in the 5th FLOOR CONFERENCE ROOM of the ITALIAN ACADEMY, COLUMBIA UNIVERSITY, unless otherwise specified. Click HERE for a map of the Italian Academy. Confirmed speakers: Francesca Romano Berno, Laurel Fulkerson, Myrto Garani, Roy Gibson, Charles Ham, Erin Hanses, Philip Hardie, Alison Keith, Peter Kelly, Darcy Krasne, Del Maticic, Sara Myers, Donncha O'Rourke, Alessandro Schiesaro, Katharina Volk, and Gareth Williams. For more information, please contact Katharina Volk (kv2018@columbia.edu) or Gareth Williams (gdw5@columbia.edu). Please use the following link for the Program. On October 26-27, 2018 the Center for the Ancient Mediterranean at Columbia University will host a conference in memory of Alan Cameron open to the public. The confirmed speakers are Averil Cameron, Anne Chen, Raffaella Cribiore, Anthony Cutler, Jean-Luc Fournet, Carmela Franklin, Arianna Gullo, Gavin Kelly, Michael Kulikowski, Noel Lenski, Rita Lizzi Testa, Charlotte Roueché, and Michele Salzman. Lecture title: "Old wine in new bottles: Towards a new history of Roman viticulture in Late Republican and Early/High Imperial Italy"
There is still a widespread view that Rome’s expanding economic influence over the Mediterranean in the Late Republic (ca. 250-30 BC) triggered a dramatic change in Italy’s wine industry. This bouleversement allegedly entailed a shift from 1) extensive mixed vine plantations to more profitable intensive vineyards, 2) subsistence farms to commercial ‘villa’ estates equipped with presses, 3) and free peasants to imported slaves in the agricultural workforce. The massive shipment of these wines to external markets could be traced through the widespread occurrence of Italian amphorae across the Mediterranean. When from Augustus onwards (27 BC-AD 14), Italy’s speculative vineyards lost their monopoly to the emancipating provinces, the country’s proto-capitalist villa-and-slave viticulture gradually fell into decline in the course of the 1st-2nd century AD, thus propelling Italian agriculture into a deep crisis. Over the years, many of the textual and archaeological data used in the construction of this metanarrative have proven to be discordant, or at least inconclusive, and this orthodox view has rightfully been criticized for its overly schematic approach (boom vs. bust), its one-sided focus on external markets, and its application of too unsophisticated ‘substitution’ or ‘entspezialisierung’ scenarios. In spite of all this, it has proven resilient in recent scholarship, perhaps because of its convenient simplicity, or because of its resemblance to modern-day economic systems. But above all, this shows the current lack of a sound alternative explanatory framework. In this talk, I discuss how we can use the ancient source material (amphorae, presses, villas) to draft a new biography of Roman viticulture in Late Republican and Early/High Imperial Italy. To this purpose, I focus on the role of domestic urban market developments, population trends, environment and climate, and the much-neglected survival of traditional vine agroforestry systems (arbustum) in Italy. In the end, these building blocks should stimulate us to start thinking differently about what happened to Rome’s wine business between the mid-third century BC and the end of the second century AD. Talk title: "The Survival of Latin Literature"
The International Observatory for Cultural Heritage at the Italian Academy (Columbia University) is hosting a lecture by Col. Matthew Bogdanos on Thursday, April 5, 6-8pm. Title: "Monument and Memory: A Newly Discovered Tomb in Pompeii"
A new monumental tomb has been discovered at Pompeii during renovation work on an early 19th c. public building in the Porta Stabia area. The tomb forms part of a little-known necropolis that developed alongside this important southern gate. The still-ongoing excavation has brought to light a monumental tomb bearing a long inscription on its western side—a typology unparalleled at Pompeii. This tomb, built just before the eruption of Vesuvius AD 79 (as can be deduced by the exceptional state of conservation), reveals new and important data on Pompeii's final decades. The sepulchral inscription, composed in the form of res gestae (though lacking the name and offices of the deceased), eulogizes in rich detail the life of the celebrated person and constitutes an unprecedented find at Pompeii. We learn of actions and activities carried out at important moments during this man's life, from his assumption of the toga virilis to his wedding. These events were celebrated with acts of great generosity: a public banquet, gladiatorial games, venationes of all kinds, grain subsidies, financial donations, etc. Moreover, thanks to the citation of topical events in the life of the deceased, we discover highly important information on the history of Pompeii that also appears in a famous Tacitean episode describing events in the city in AD 59. The biographical data recorded in the inscription allow us to tentatively identify the anonymous person celebrated in the elogium. As we shall see, this newly-discovered epigraph undoubtedly constitutes the most significant discovery of the new millennium for Pompeian archaeology. Lecture Title: "The Hippocratic Oath in Context: Physician, Patient and Suicide"
Abstract: "The ancient Hippocratic Oath, presumably – after the Bible – the most influential (and intensively discussed) text from Classical Antiquity, still remains enigmatic. It is not mentioned in ancient sources before the first century CE but then – in the first three centuries CE – it occurs in several contexts. The main problems of interpretation will be presented in the talk. The text of the oath is to be contextualized, especially the famous passage regarding the prohibition to give a deadly medication (“pharmakon thanasimon”). It will be argued that the oath is (at least in part) a reaction on the increasing demand for physician-assisted suicide." Abstract: "The second half of the fourth century BC has always been remembered as a period of immense change for Roman society. With the final conquest of the Latins and the ‘Latin Settlement’, the ending of the ‘Struggle of the Orders’, and the successful conclusion of the ‘Great Samnite War,’ in a few short decades Rome supposedly went from being a large, but internally divided, city-state to the master of all Central Italy. Perhaps not coincidentally, this period was also remembered as an era of change for the Roman army, often associated with the adoption of new military equipment (traditionally, the oblong scutum, pilum, Montefortino-style helmet, etc.) and the advent of Rome’s so-called ‘manipular’ structure. And whether these changes were accurately remembered or not, whatever the Romans were doing militarily c. 300 BC did seem to serve them well. While previously they seem to have been on reasonably equal footing with many of their Latin and Italian neighbors, by c. 300 BC the Romans seem to have moved into a league of their own – at least within Italy. Featuring the ability to recruit massive numbers of troops quickly, immediately integrate allied soldiers, and field effective armies containing an impressive amount of diversity, the Romans are often argued to have struck upon an almost perfect military model during this period. This talk will explore the elusive nature of Rome’s military system during this period, highlighting new directions in scholarship and searching for the key(s) to Rome’s military success in the middle Republic." Lecture title: "Debt and Child Labor in Antiquity: The Case of a Peasant Family from Roman Egypt"
Lecture abstract: "This paper explores the socio-economic strategies of an ancient family as they navigate the challenges of peasant life in Roman Egypt. In particular, I examine the role of child labor, formally contracted out through service agreements (akin to indentured servitude), in helping to keep the family afloat. The source of this unique insight on ancient peasant life is the papyrus archive of Harthotes, a public farmer and priest who lived in the Fayum village of Theadelphia in the time of Augustus. We will explore whether Harthotes’ story can serve as a model for peasant family strategies in Greco-Roman Egypt and the ancient world more generally and see how his family’s use of child labor compares with cross-cultural typologies." A one-day conference marking the 200th anniversary of the birth of Nobel Laureate Roman historian Theodor Mommsen. Participants will include: Clifford Ando (University of Chicago), Werner Eck (Universität zu Köln), Bruce Frier (University of Michigan), Zachary Herz (Columbia), Suzanne Marchand (Louisiana State University), Maya Maskarinec (USC), Michael Peachin (NYU), and Stefan Rebenich (Universität Bern). A full schedule is available at the bottom of the page (or as a pdf here). 10:25-11:10: Werner Eck (Köln) [in absentia], "Inscriptions into History: CIL as the Foundation of the Prosopographia Imperii Romani"
4:50: Michael Peachin (NYU) will comment on the day’s papers. This is a placeholder date. Prof. Viidebaum's lecture has been postponed. Title: "The Archaic Cretan City: Results of Recent Excavations at Azoria"
Abstract: "The Azoria Project completed its second five-year campaign of excavation in 2017, recovering new evidence for the political economy of a Cretan city in the earliest stages of its development. The excavations confirm a stratigraphic horizon at the end of the 7th century B.C., in which the site was rebuilt, transforming the topography, physical structure and function of the protoarchaic settlement, and establishing a number of monumental public buildings and elite residences of archaic date (6th-early 5th c. B.C). New forms of civic and domestic architecture characterize the urban center, with in-situ contexts permitting the evaluation of material patterns of resource mobilization, storage, redistribution and consumption. The contexts include assembly and feasting halls and associated cult buildings; storage facilities; and buildings dedicated to the large-scale processing of foodstuffs for communal feasting. The presentation reviews the results of this recent work, and discusses the implications of centralized and state-administered agricultural storage and redistribution for understanding the sociopolitical organization of the early archaic city." 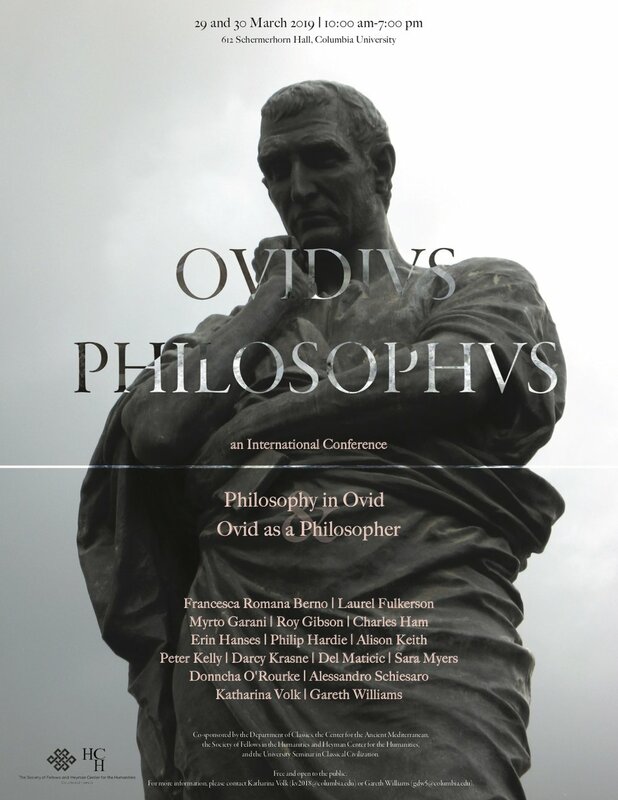 On Saturday October 14th, CAM will host a symposium for the presentation, discussion, and celebration of the newly released nine-volume Loeb edition of Early Greek Philosophy (edited and translated by André Laks and Glenn Most). Speakers will include Glenn Most (Scuola Normale Superiore), André Laks (Université Paris-Sorbonne in Universidad Panamericana, Mexico D.F./Université Paris-Sorbonne), Christian Wildberg (Princeton), and David Sider (NYU). Other participants include Marcus Folch (Columbia), Dhananjay Jagannathan (Columbia), Marc Van De Mieroop (Columbia), and Katja Vogt (Columbia). 11:15am-12:15pm: André Laks - "How Preplatonic worlds became ensouled: an episode in the history of reception," followed by discussion. 12:15-1:00pm: David Sider - "Repetition in Empedocles," followed by discussion. Abstract: "A brief look at how Empedocles often returns to the same thought with repetition or with near repetition for purposes both artful and philosophically meaningful in ways that Lucretius sometimes imitates." 2:30-3:30pm: Glenn Most - "Thales and the Beginning of Philosophy," followed by discussion. Abstract: "In his Metaphysics, Aristotle calls Thales the founder of a certain kind of philosophy. Should we believe him? In order to answer this question, we must try to answer four other questions: 1. What do we know about Thales? 2. What did Aristotle know about Thales? 3. What did Aristotle mean when he said that Thales was the founder of a certain kind of philosophy? 4. Why did Aristotle say this? In this lecture, I attempt to answer these questions." 3:30-4:15pm: Christian Wildberg - "Two New Editions of the Presocratics – and What to Do With Them," followed by discussion. Abstract: "This talk will first take a critical look at the Loeb edition of the Presocratics as well as the French Laks-Most edition, also published recently, and then suggest two ways in which both of them might give the study and our understanding of the beginnings of Western philosophy new impulses and directions." 4:45-5:30pm: Round-table discussion (featuring Marcus Folch, Dhananjay Jagannathan, Marc Van De Mieroop, Katja Vogt, André Laks, and Glenn Most). Join CAM in celebrating the start of a new academic year at our welcome-back reception! We look forward to seeing many faces, both familiar and new! Title: "Suicide in the Hebrew Bible and the Ancient Near East"
Abstract: "Suicide raises questions about the meaning and purpose of human life, and the different ways society deals with it are currently being debated not only in society but in different fields of research as well. However, an extensive study of suicide in ancient Israel and its neighbouring cultures of ancient Egypt and Mesopotamia has been missing, and it is the aim of the book presented to close this research gap. In my paper, building upon my book, I do not view suicide from medical or dogmatic-theological perspectives, which regard suicide as an act of mental illness or sinful deed. Instead, it is viewed from a historico-cultural and sociological perspective and focuses on the motives and meanings behind suicidal acts. By examining suicidal act from this angle, they are interpreted as attempts to solve basic problems of life, and the historical material available is categorised into three basic forms: escapist suicides, aggressive suicides, and suicides of passage and sacrifice." Professor Francesco Guizzi will be conducting a seminar at CAM. Topic: "Water Supply in the Lycus Valley under the Roman Empire (I-III century CE)." Abstract: "The seminar addresses the issue of the water supply of the two main cities in the Lycus Valley, an area of Asia Minor extending from the Maeander bight to the Lycus river: Hierapolis of Phrygia and Laodicea. Recent epigraphical discoveries shed fresh light on the topic. 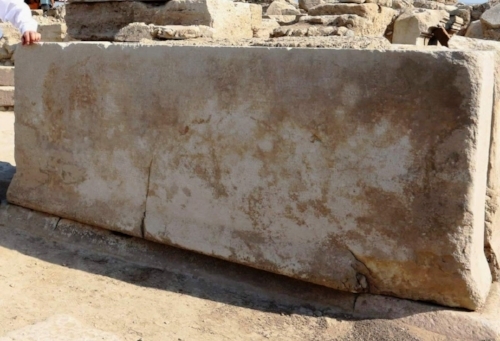 Among these a proconsular edict, unearthed in Laodicea in 2015, stands out. This public document provides an useful parallel with other sources, both literary and epigraphic." IMPORTANT NOTE: This event will take place in the Papyrology and Epigraphy Reading Room of Butler Library, Columbia University. As this event will be conducted as a seminar, rather than a lecture, and due to the size of the room, space will be limited. As such, Columbia affiliates (or non-affiliates who have Columbia library access) who wish to attend are requested to register for the event. Additionally, because Butler Library is not open to the public, non-Columbia affiliates will be required to register at least one week in advance in order to be granted access to the library for the event. TITLE: "Putting on a Show at The Met: The Creation of Pergamon and the Hellenistic Kingdoms of the Ancient World"
ABSTRACT: In 2016, The Met presented a landmark exhibition of art from the Hellenistic Age in an historic collaboration between the Metropolitan Museum of Art and the Pergamon Museum in Berlin whose celebrated sculptures comprised approximately one third of the 264 artworks in the exhibition, many of them traveling to the United States for the first time. The Hellenistic period, the three centuries between the death of Alexander the Great of Macedon in 323 B.C. and the establishment of the Roman Principate in 27 B.C., was a critical era in the history of Greek art that has traditionally received less attention than earlier periods. This major international loan exhibition examined the rich diversity of art forms that arose through the patronage of the royal courts of the Hellenistic Kingdoms placing a special emphasis on Pergamon, capital of the Attalid dynasty which ruled over large parts of Asia Minor. Seán Hemingway, a lead curator of the exhibition, takes a behind the scenes look at the conceptualizing of such an elaborate show and the complex process of bringing it and its catalogue to completion over the course of more than five years of dedicated work in collaboration with a large team of professionals at the Met and colleagues from twelve countries around the world. NB: This lecture will take place in 612 Schermerhorn Hall. TITLE: Identifying people in Hellenistic and Early Roman Egypt: A comparative perspective? ABSTRACT: Hellenistic rulers and the Roman government were already exposed to the issue of identifying people for juridical and fiscal purposes. The systems that were used in Egypt at both periods have been variously interpreted and often contrasted. By looking at legal and fiscal documents preserved on papyri, this paper explores how official categories of persons allowed both states to single out groups that were particularly valuable to the state formation process and whose loyalty was essential. It suggests that both systems are more similar than usually thought and that the Roman system in Egypt can be understood as a systematization of developments already occurring in the last century of Ptolemaic rule. However, in contrast to the early period Ptolemaic, this systematization did not create new elites, but rather maintained the privileges of most of the same families. Please note that this lecture will be taking place on Tuesday evening. Professors Francesco de Angelis (Columbia) and Marco Maiuro (Rome La Sapienza, and Columbia), directors of the Advanced Program of Ancient History and Art (APAHA) will present the main results of the excavation at Hadrian’s Villa, discuss the historical significance of the findings, and announce some exciting developments of the project for 2017. With over 80 participants—35 of whom enrolled in the Classical Studies Summer Class and several others returning as “veterans” from previous iterations of it—the 2016 fieldwork season has been the most intensive and the most productive one since the inception of the program. The excavation of the “Lararium” courtyard revealed a pre-Hadrianic channel running under the precinct’s floor and provided further data on the Medieval phases of the complex. The continuation of the exploration of the building in the area of the so-called Macchiozzo brought to light new rooms with their mosaics and their painted walls and ceilings. Furthermore, the expansion of the excavation in the surroundings of the Macchiozzo building began to uncover architectural remains that were last seen (and only partially documented) by Piranesi in the 18th century. This presentation will take place in the Teatro (2nd floor) of the Italian Academy, Columbia University. A reception will follow. All welcome! Please click here to register for the event. Professor Moyer's lecture, originally scheduled for February 10, has been postponed to Friday, March 10. Title: "At the gates of the temple: Tracing the boundaries of Hellenistic political culture in Ptolemaic Egypt"
Abstract: "The Hellenistic polis, as a recent body of scholarship has shown, manifested its political identity and authority through a range of shared epigraphic, material and spatial practices – practices that defined the public space of the city. To what extent did that common Hellenistic political culture extend to Ptolemaic Egypt? Through an examination of priestly decrees, statues, and other practices of the temple gates and forecourts, this paper attempts to trace the boundaries of Hellenistic political culture and the limits of its recognition." Title: "Recontextualizing Nilotic Scenes: Interactive Landscapes in the Garden of the Casa dell’Efebo, Pompeii"
TITLE: "From Hortus to Hayr: The Connections between Classical and Early Islamic Gardens"
The continuity between the visual and material culture of the classical and the early Islamic worlds is well established. The Dome of the Rock in Jerusalem and the Great Mosque in Damascus were decorated with stunning mosaics that drew upon the traditions of late antiquity. Scholars have yet to fully consider the relationship between classical and early Islamic gardens. The charbagh (quadripartite) garden, defined as the quintessential Islamic garden, was once thought to be an ancient Persian design; however, a recent reconsideration of the evidence at Pasargadae has demonstrated that this was not the case. Therefore, it is an opportune moment to examine the connections between ancient and early Islamic gardens. The mosaics in the courtyard of the Great Mosque in Damascus contained architecture and landscapes that evoked the architectural traditions of Alexandria and second style Roman wall paintings. While the landscapes in the Great Mosque of the Damascus have been interpreted either as representations of the local landscape and the Barada River or of Paradise, the other evidence for early Islamic gardens and landscapes has yet to be explored in depth. Using the mosaics of the Great Mosque as a starting point, this talk examines the evidence for continuity and transformation between the gardens and landscapes of classical antiquity and those of the early Islamic world in Syro-Palestine and Iberia. Several of the folios from some of the earliest known Qur’ans, discovered in the roof of the Great Mosque in Sana’a, Yemen, include representations of mosque architecture. Three folios also depict plants and trees. I consider how these Qur’anic landscapes relate to the landscapes in the Great Mosque of Damascus and to those appearing in the floor mosaics of late antique churches. The second part of this talk focuses on the archaeological evidence for early Islamic gardens and landscapes. The so-called “Desert Castles” of the Umayyad period (661–750 CE) are an important source of evidence for understanding the conceptualization and construction of early Islamic gardens and bounded landscapes. Specifically, this paper considers the hayrs, or the bounded hunting parks, that were associated with many of the 8th-century Umayyad caliphal residences, including Khirbat al-Mafjar, Qasr al-Hayr al-Gharbi (West), and Rusafa. For the “Desert Castles,” where we lack any trace of enclosed gardens, the artistic representations of hunting scenes (e.g. Qusayr ‘Amra) inform us about the importance of hunting as an expression of kingship. The gardens of Islamic Iberia, where there was a long and well-developed tradition of Roman and late antique villa and domestic gardens, is also important for understanding the debt of the early Islamic garden and villa to the villa and garden traditions of the ancient Mediterranean. Recent scholarship on the munya, the early Islamic villa, has demonstrated that the munyas and their gardens and cultivated enclosures were an important aspect of the Iberian landscape during the transition from late antiquity to the early Medieval period. The presence of courtyard gardens in the 10th-century palatial city of Madinat al-Zahra (outside Cordoba) and in other cites is also examined. The concepts of the villa urbana and the villa rustica have been used by James Dickie to interpret the gardens of Islamic Spain, especially those of the Madinat al-Zahra, and those of the Alhambra palace in Granada. This paper reassesses the use of Roman concepts to interpret the gardens of Islamic Iberia and the legacy of Roman gardens in these important Islamic gardens.